It's Thursday so I'm 'throwing it back' to a popular past post! This post has been 'pinned' on Pinterest nearly 20,000 times! Can you believe it?! Check back next Thursday for another peek into 'The Best of Crafty Teacher Lady'! Follow along with my daily life via Instagram! I'd love to hear from you! I'm so excited to decorate for fall! 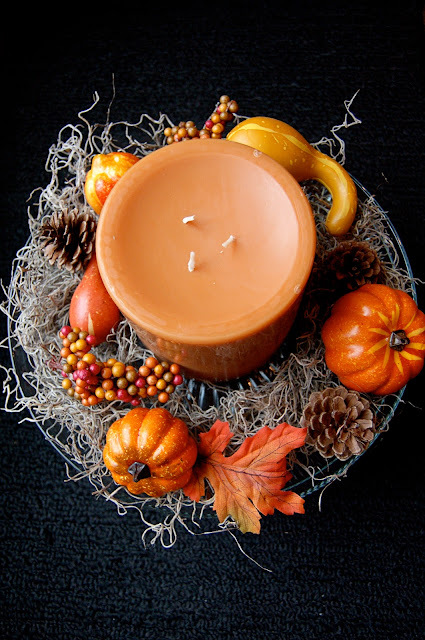 Although on a pretty tight budget, I've found creative and inexpensive ways to add touches of fall around my house, mainly by shopping at the Dollar Store, WalMart, and other bargain outlets. Two projects I'd like to share are a candy corn votive display and a moss candle centerpiece, both have elements found at the dollar store! 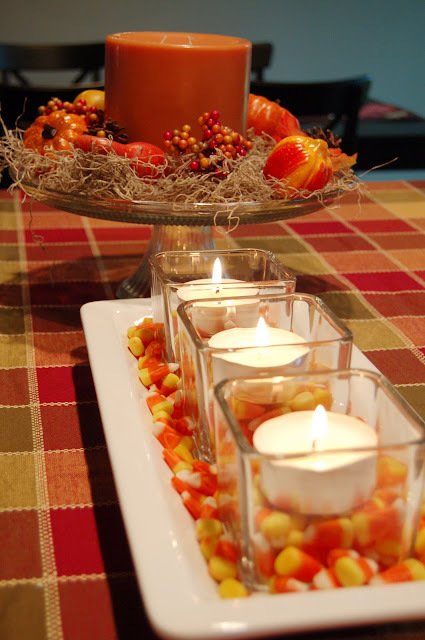 Each of the three glass candle holders are from the Dollar Store as are the votive candles and the candy corn! Simply fill each glass half way with candy, then place the votives on top. I chose to place all three glasses in a long dish, then filled the bottom with candy corn. 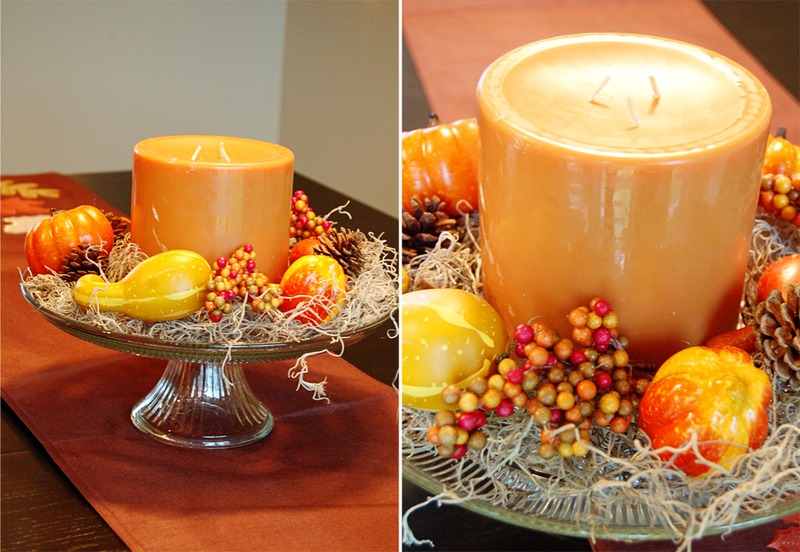 I placed a large 'apple cider' scented candle from WalMart in the center of a glass cake stand. Around the candle I placed moss from the Dollar Store as well as pumpkins, berries, leaves, and pine cones found at Christmas Tree Shops (one bag full for $4.99). I did find bags of faux leaves at the Dollar Store, too! In the pictures above, you can also see the pretty table runner found at Marshall's for $10! Next up, making a wreath for the front door...stay tuned! Cute layout! Totally loving the candy corn idea! Thanks so much! I think the candy corn is a whimsical touch! Super ideas! I adore the candy corn filled votives. Although at my house, they would probably get eaten - the candy corn that is, not the votives! Thanks, Yvonne! I'm not a big fan of candy corn as far as eating goes but they work out perfectly as decorations! You have some really cute thrifty ideas...come over and share them at my NIFTY THRIFTY TUESDAY party. I’m having a charming GIVEAWAY this week at my blog…come by and check it out! Thanks for the invite, Linda! I just linked up! Very cute. I love candy corn too! Great idea! 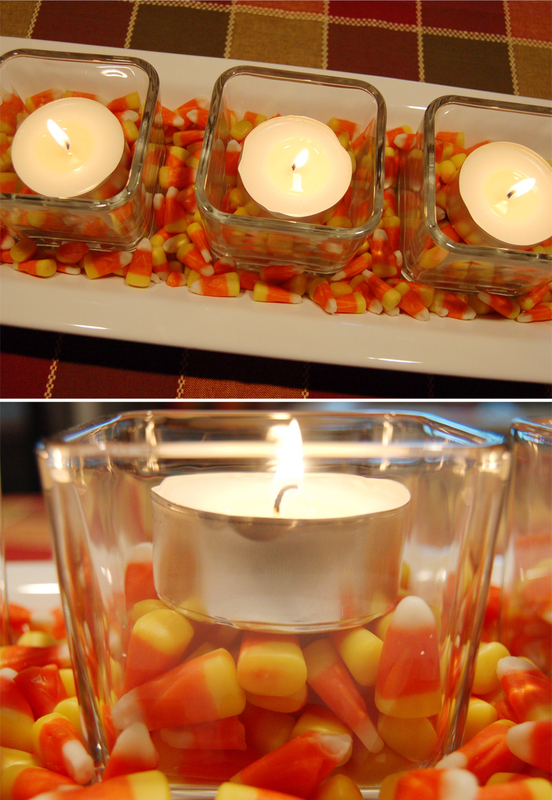 I love the candy corn votive idea.. It came out very cute.. The candy corn votive idea is a great..